So I took a long absence from blogger but have returned at last! I haven't really introduced myself formally here. My name is Kirby. I am a nineteen year old student currently attending Seattle University studying strategic communications with a minor in either french or art history. I like many things and will use blogger as a way to share my interests with all of you! 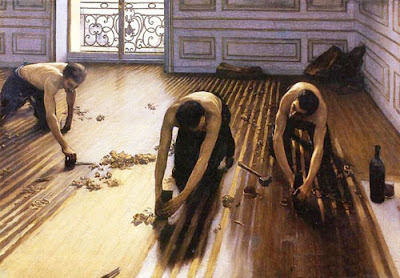 I was sitting at a local coffee shop this evening and read about the nineteenth century artist, Gustave Caillebotte. I love his work. I think his pictures are beautiful. I really enjoyed this oil on canvas which is titled Floor Scrappers.